The high speed rail terminal located in Singapore linking all the way to Kuala Lumpur will be situated in Jurong East. Announced today (05 May 2015), Singapore’s Prime Minister Lee Hsien Loong mentioned that this would integrate strongly with Singapore’s mega plans to regenerate the district into the nation’s 2nd central business district (CBD), creating opportunities for businesses and the people in Singapore. This is set to add further boost to sales for the latest new launch condo Lakeville and Lake Grande (situated at Jurong Lake District). A video report from Channel News Asia in 2014, reporting on the progress of talks a year ago.PM Lee has noted that Jurong East was selected as a more favorable location as compared to the other 2 proposed options – city centre and Tuas, because the city center is too dense, posing potential major difficulties in construction and not many business are settling in Tuas as compared to Jurong East. At the press conference, Malaysia’s Prime Minister Najib Rezak has also identified five stations along the approximately 400 kilometer (km) long track, starting from Malaysia’s capital city, Kuala Lumpur, travelling southwards to Seremban, Melaka, Muar, Batu Pahat, Nusajaya and ending with Singapore. 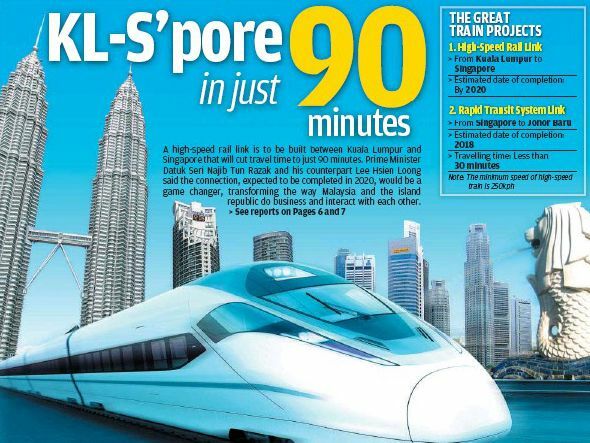 This High Speed Rail mega project was agreed between both countries in 2013, aiming to reduce travelling time between Singapore and Kuala Lumpur to only 90 minutes. Both Prime Ministers mentioned the project was targeted to complete by 2020. However, because of the scale and the complexities involved in this project, specific details are required to be looked into again and a revised schedule has yet to be given. PM Najib Rezak also added that this high speed rail link is exceptionally important as it marks the 50th anniversary of bilateral ties between both nations. Some details with regards to duration of the entire project were also highlighted, such as the process to design the rail link and tender for construction. Both milestones will take approximately a year. For construction, it will likely to take another 5 years. Both PM Lee and PM Najib said that more information on the new completion date of the high speed rail link shall be announced at end 2015, after both nations have come up with a complete official agreement. As noted by PM Lee, certain leading decisions have not been made, such as funding, equity distribution between 2 countries and also construction details. But he has asserted that both governments are convinced and positive that this mega project will be a success.